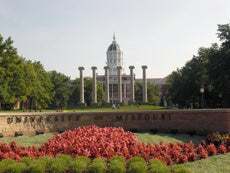 Founded in 1839, the University of Missouri at Columbia was the first public university founded west of the Mississippi. Among its 270 degree programs is its honored journalism program, the world's first, established in 1908. At MU, there's a policy that effectively bans credit card companies from setting up tables around campus, according to Joe Hayes, Missouri Student Unions assistant director. He has worked for the university since 2005, and in that time, no credit card companies have recruited on campus. Hayes says that is because the university has made it difficult for the companies. "We charge. For noncampus users, we charge $150 per table," he says. "And that money goes back to student programming." The university's policy toward credit card vendors states "No promotional 'gifts,' i.e. 'free' items, offered as incentives for filling out an application will be permitted." Hayes says all those requirements are in place to protect MU's students. "We see it as kind of our responsibility as educators to let them know what they're getting themselves into," says Hayes. "That's the whole point of an educational institution. The education doesn't end in the classrooms." "I'm not in favor of [legislation] like this. Especially the arbitrary age of 21 is nothing that really shows in my opinion a level of responsibility. We should have the choice of whether we have a credit card or not. People who get into debt -- that's their fault. Legislation should have no say over that." The Francis Quadrangle where six columns remain from MU's first academic building that burned in the late 1800s. In the background is Jesse Hall, an administrative building. "If someone gets a card at 18 as opposed to 21, what's the difference? What have they learned in those three years? I don't think the age is going to make them that much more responsible." "People clearly don't know how to spend within their means. I can see it getting out of control very quickly. I wouldn't want to spend my life playing catch-up." "From my personal experience, most people my age don't have any idea what they're doing to their credit." LESSON: When is it a good idea to piggyback on mom or dad's credit card?